Seth Myers gets a special treat this week, as Jerry Seinfeld takes his prized 1973 Porsche 911 Carrera RS out for a spin. 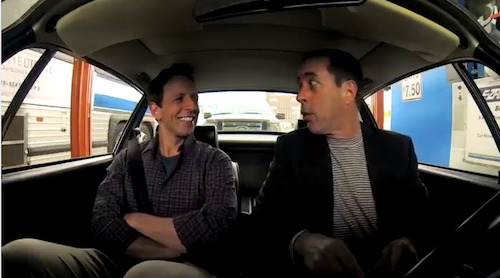 One week after driving legendary comedian Don Rickles around in a 1958 Cadillac Eldorado Seville, Jerry Seinfeld is back behind the wheel in the latest episode of Comedians in Cars Getting Coffee. This week’s installment features Saturday Night Live’s Seth Myers and a classic 1973 Porsche 911 Carrera RS. Each week, Seinfeld attempts to pair his guest with the ideal vehicle, but this week the comedian has actually chosen a perfect car. “There’s something about this car that feels perfect,” says Seinfeld when describing the Carrera RS. According to Seinfeld, he bought the vehicle from a dead man and will not relinquish it until he dies. In summation: No one in their right mind would ever give up this car. A truly unique piece of machinery, the 1973 Porsche 911 Carrera RS marked the first time a car company put a racecar into production. Not to mention, this 210 horsepower vehicle was the first car with an aerodynamic spoiler to be sold to the public. In total, only 1,580 were made. As for the coffee and conversation, Seinfeld and Myers mainly discuss his tenure on SNL, which he joined in 2001. Despite primarily appearing as a bit player in his first few seasons, Myers has risen to the show’s head writer and the host of Weekend Update. A self-described “Porschephile,” Seinfeld is the owner of an estimated 46 Porsches. At one time, the avid car collector had to rent space at the Santa Monica Airport to store just part of his collection. The comedian’s Porsche collection reportedly includes multiple Porsche 911s, ten Porsche Boxsters, a 1955 Porsche 550 Spyder, and a rare Porsche 959. Seinfeld has even penned several Porsche reviews for publications like Automobile Magazine. In fact, Seinfeld earned a Road Pest Silver award at the 2004 International Automotive Media Awards for his review of the Porsche Carrera GT. Stay tuned for next week’s episode of Comedians in Cars Getting Coffee, which features Grown Ups 2 star Chris Rock. Click HERE to watch a preview. The next edition of Comedians in Cars Getting Coffee premiers next Thursday on Crackle. Watch this week's episode below, and be sure to check out the surprise vintage car commercial at the end.